Few people can make potatoes look that decadent. Lady, you are pure magic behind the camera. BTW, love the French word of the week feature. Keep it coming. Gorgeous! I love the simplicity of roasted potatoes. I love potatoes, and these look particularly stunning. but more importantly, where oh where did you get they beautiful baking dish that looks like it was made out of an old tin ceiling? One of my favs, also and your pics, of course, make me very hungry! I can almost smell those purple lovelies. i am a potato girl too! I remember in college that is all I ate, potatoes roasted, mashed, baked! so simple to make and so tasty! Looks amazing!! and the picnic..ahh..I wish I had someone who would make it for me..a dream date :>) Will have to hint to the hubby. That's the most beautiful potato salad I've ever seen! Bravo! Beautiful! Love me some potatoes. I was recently given some Purple Congo potatoes and they are so beautiful! It's fantastic to see you using them too. They are absolutely stunning when roasted, that colour is magical! Lovely photos, as always!! Mmm, I too am a potato girl! It was such a comfort to me, after having to go gluten-free, to still be able to eat one of my favorite carbs! Whenever we go camping, I always bring along a couple potatoes to roast in the campfire - seems to me to be one of the best ways to eat them! Lovely. We picked up the habit of roasting pomme de terre when vacationing in Provence (is that where you are from?. Of course it tastes best with grilled lamb, seasoned with wild thyme from the garden, but we tried it at home and it still tastes fantastic! Ps I guess TS Tannie is trying to say that the blue potatoes are human made, but they are not, are they? I am always amazed at how you make the simplest things look so beautiful! And making a potato looks beautiful is an art in itself! Gorgeous! well..i'm more of a noodle girl(including pasta),but this looks oh-so-nice too..never ate purple potatoes before though. Nothing more comforting than a bowl of potatoes on a rainy Saturday!!! I have never seen these violet potatoes in Poland! :( amazing pics! These look delicious! And so gorgeous. Not just a beautiful and simple dish but a French lesson to boot! 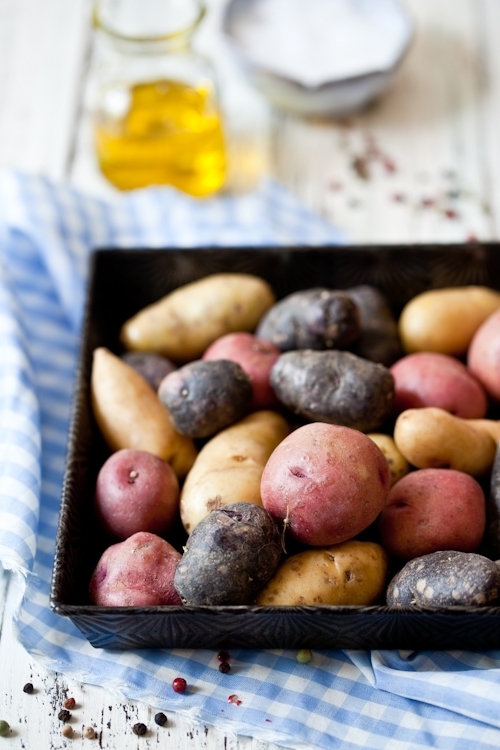 I love this dish; although no where near as charming, my local Costco now often has a mix of the multi color baby potatoes and this is my go to dish. But enough about potatoes. It's the French lesson I love. I have five years of French inside my brain somewhere but from such a long time ago, most is forgotten. I've loved having your articles bring those words back to life and be able to recall something other than 'Open the Door' and 'Shut the Window' and a few phrases I won't repeat here. Thank you...this is something fun I look forward to each week. We call this dish "nuggets of love" in my house. The potatoes get that nice crunchy exterior from the oil and are so soft and sweet inside that they somehow were coined this name. Thanks for sharing! These potatoes look beautiful. The colours are gorgeous. Recently as I've been running more I have ben craving carbs, rice, pasta but not potatoes as such. 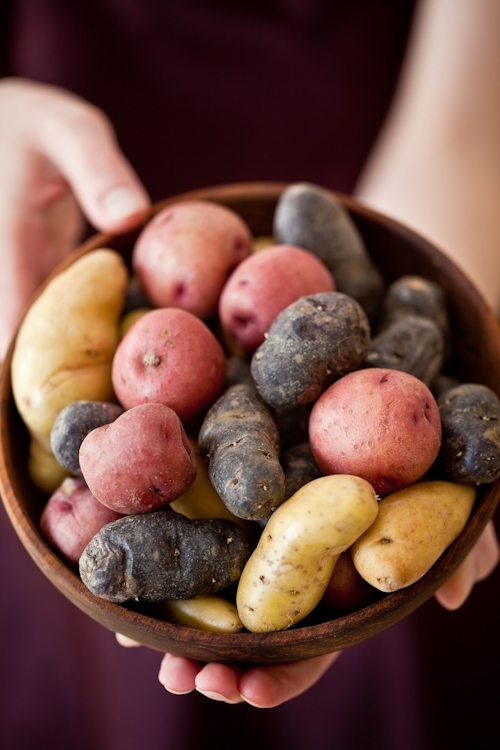 However, looking at these I really want some simple roast new potatoes with a knob of butter, heaven! Also, you are so talented. I would love to do your job! So gorgeous, I like those type of photos !! What great potatoes! How yummy are they! Congrats on your photos in Charleston Magazine! We actually subscribe to that one here, so I'll look forward to seeing your photos in print. Your style is so clean and bright, what a perfect match for the topic! TSannie: the purple is all natural and not a dye. They are called Peruvian potatoes also. I admit to having a bit of a love affair with potatoes myself, and yours look downright gorgeous. Thank you for the beautiful pictures to start my day. Thanks for the beautiful recipe and photos! Those little blue potatoes are absolutely gorgeous! 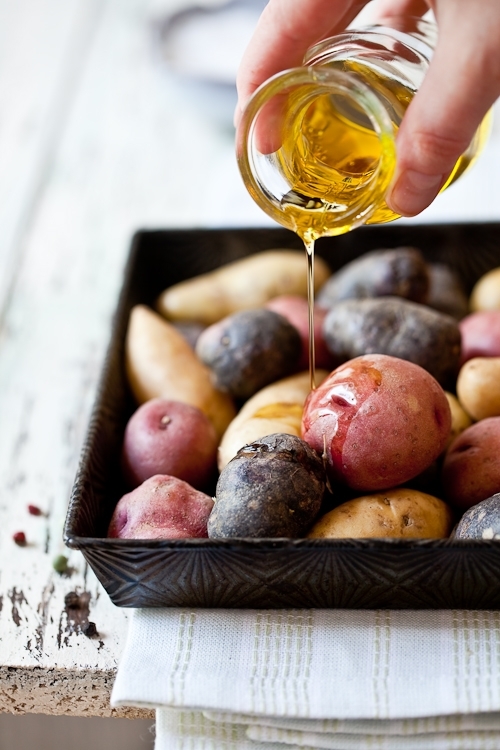 Potatoes are my favorite food and this dish looks wonderful! Omg I'm drooling!!! Amazing dish, thank you! 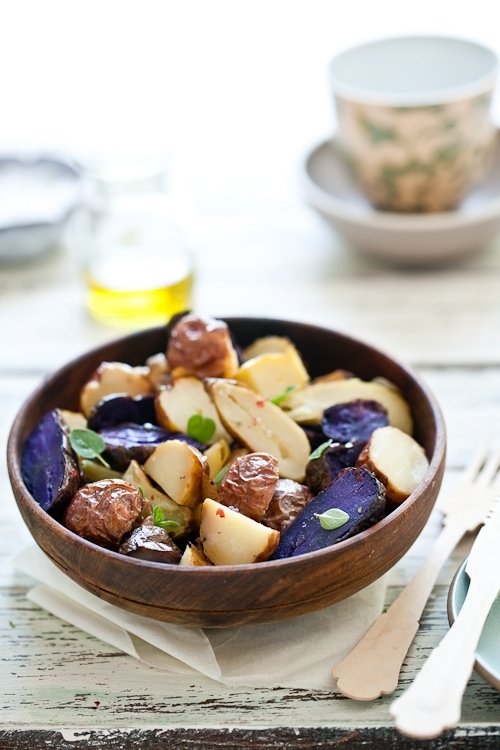 A simple & perfect potato salad. I can't get over how eye catching the purple potatoes are. They add so much to the beauty of this dish. I tried this salad last night with a few of my own twists. I used Yukon gold potatoes cut into cubes, rosted with garlic and olive oil at 450 for 60 minutes, then sauted mushrooms/onions to go along side it dressed in a dijon mustard, tarragon, rice vinegarette. Delish. Thanks for the inspiration! 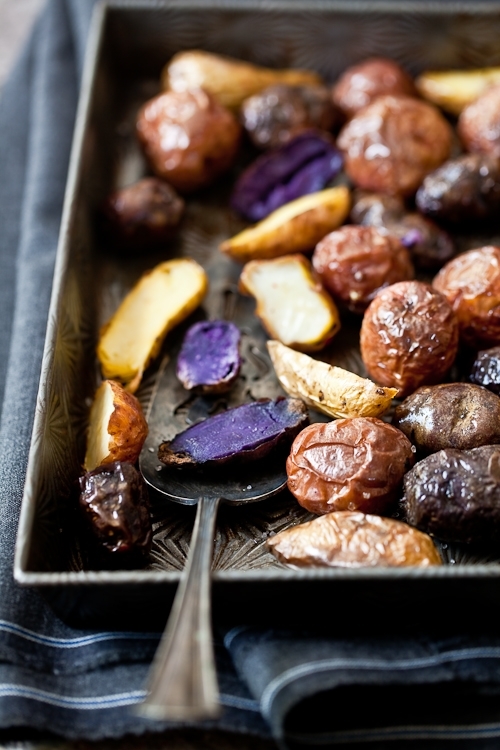 Omg your purple potatoes are stunning ! And I'm a potato girl too lol : in France it's the season of the delicious Pommes de terre de Noirmoutier <3 And your article has made me think of the joy I have had the other day to eat such food ! Merci : simplement délicieux ! I wish there were dark purple pomme de terre. But overall, if I am not mistaken, potatoes contain anti-oxidant as well. It is not such bad food. Helene, I love this photo series. The colors are divine - esp. in the last one. It's fun to see you do more and more savory too! SO this is going to be on the menu for lunch today! i absolutely love the roasted potatoes. Wow love these photos and the colors - thanks for sharing! Your pictures were amazing! Love the pan you used. You inspired me to make a warm potato salad today! I roasted the potatoes, then added in some diced up red peppers, green onions and hard boiled egg. Then, I finished it off by mixing in a bit of creme fraiche and prosciutto. I will be posting the recipe soon on my blog, so check it out when you have a moment! Wow! Great tip for potatoes. I'll try tomorrow.